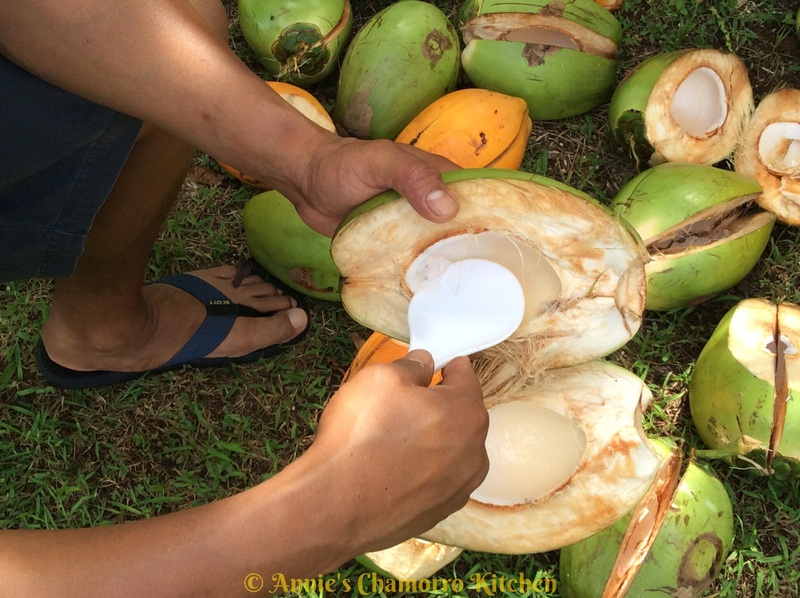 Apigigi’ is a Chamorro dessert that takes quite a bit of time to make, if prepared the traditional way. 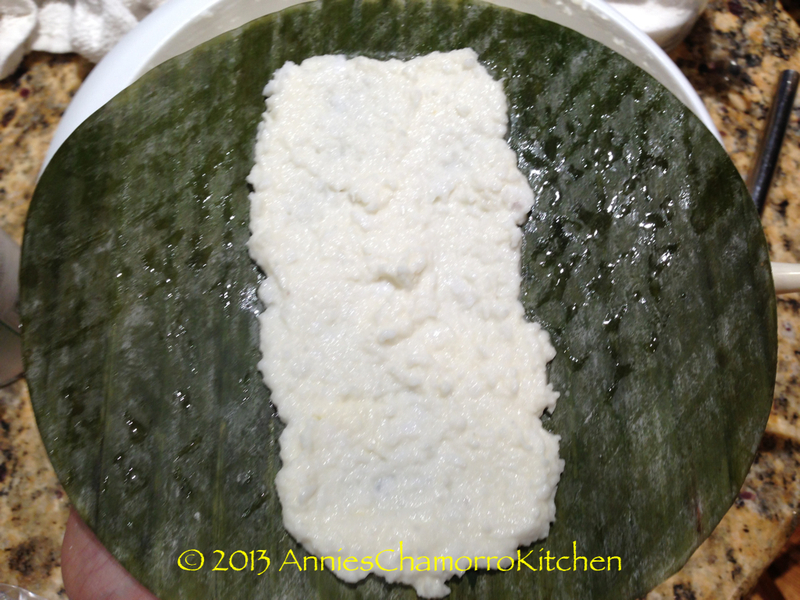 It calls for grated cassava or tapioca, coconut milk, young coconut meat or månha, and sugar. Mix it all together, grill (or steam for sweet tamåles), and a few hours later you have a delicious dessert that is savored all the more for all the effort it took to make it. I still remember when I was little; we’d make this mixture the old fashioned way. First, my mom would dig up some tapioca roots, peel them, then we’d grind them in that old fashioned grinder that you had to clamp to a table and rotate a hand-crank. 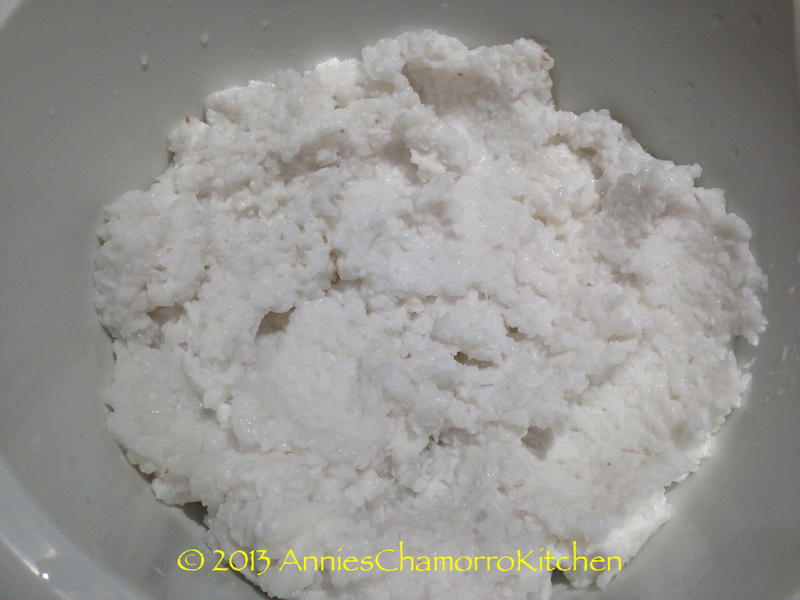 Then came the task of making coconut milk. 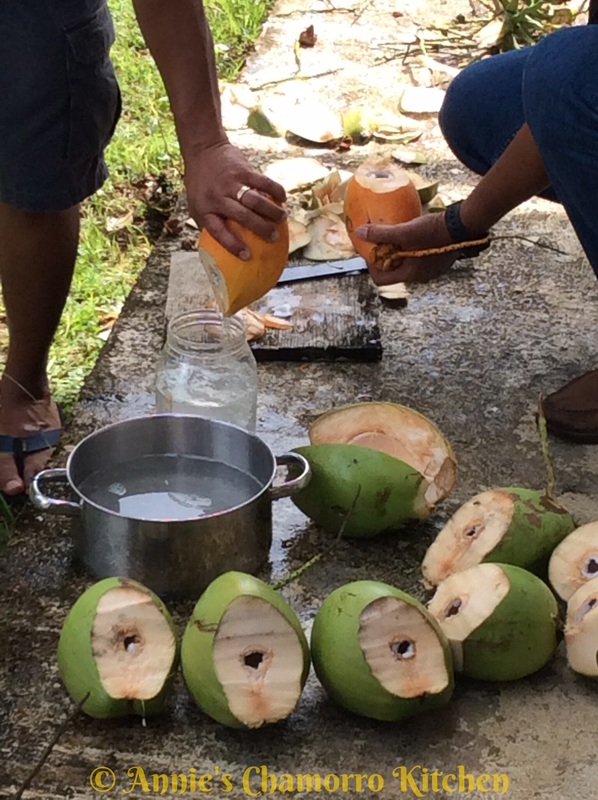 First you husk the coconut (shake it first to make sure there was liquid in it; that meant it was still good). Then you grate the coconut using a kåmyu. 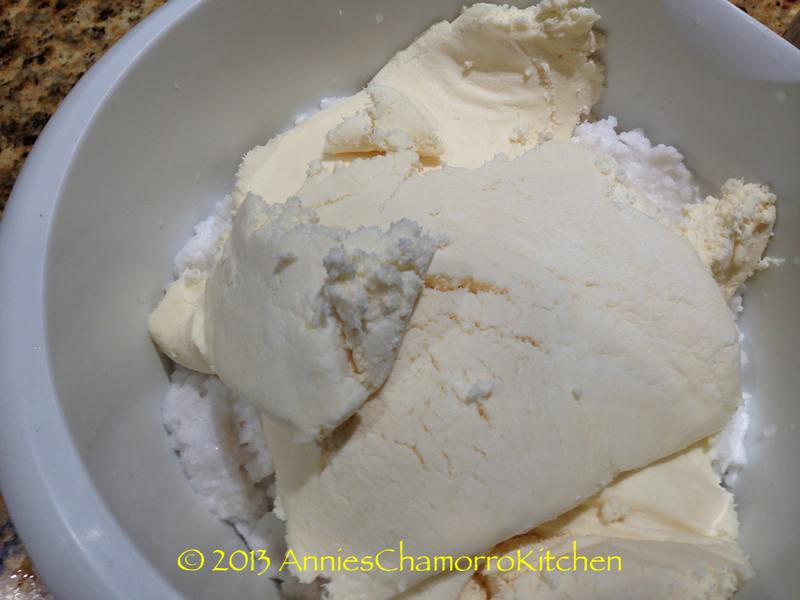 Lastly, add a little bit of water and squeeze the heck out of the meat to get thick, delicious coconut milk. Then there was the task of getting månha. As much as I did not care for grinding the cassava, I really didn’t like this part of the job (I only liked drinking the månha juice), only because in order to get a couple of cups of sweet månha, we had to cut open about a dozen månha then carefully scrape out the meat, being careful not to scrape out the husk with it. Of course, I always got a lot of the husk with the meat–I think this is why I hated this task most of all. I had to go back and pull off all the husk off the meat before we could use it. 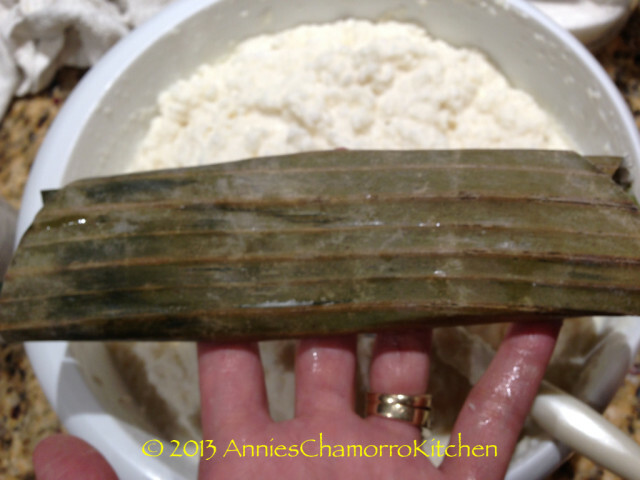 Grilled for apigigi’ or steamed for sweet tamales, this recipe is another family favorite. 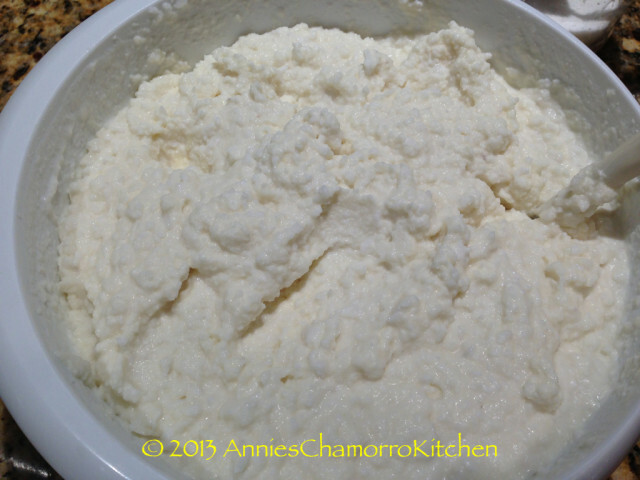 Make sure you read all the way to the bottom of this post for my twist to this Chamorro favorite. 1. Chop the manha, then mix it with the cassava, sugar and coconut milk. 2. Spread a thin layer down the center (lengthwise) of the banana leaf. Fold each side in, over the batter. 3. Grill over hot coals or on a stove-top grill pan, about 10 minutes on each side. Let cool then serve. 4. If making sweet tamales instead of apigigi’, fill snack-sized ziplock bags with about 4 tablespoons of batter. Wrap the bag with foil then steam the foil packets for 20 minutes. Allow to cool then serve warm. You can also chill the tamales and serve cold. 1. 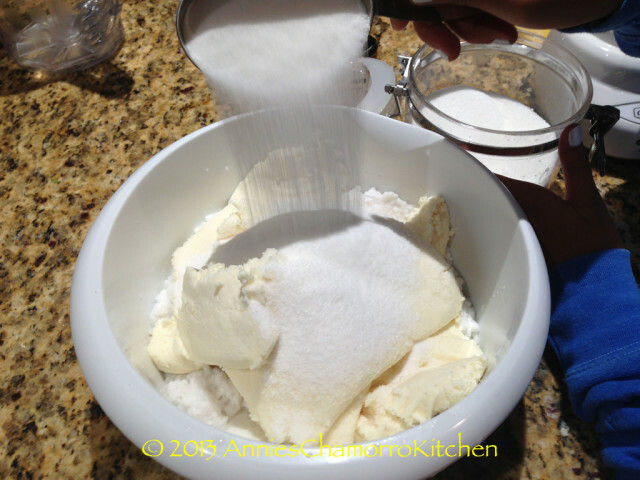 Dissolve the cornstarch and sugar in the coconut milk. 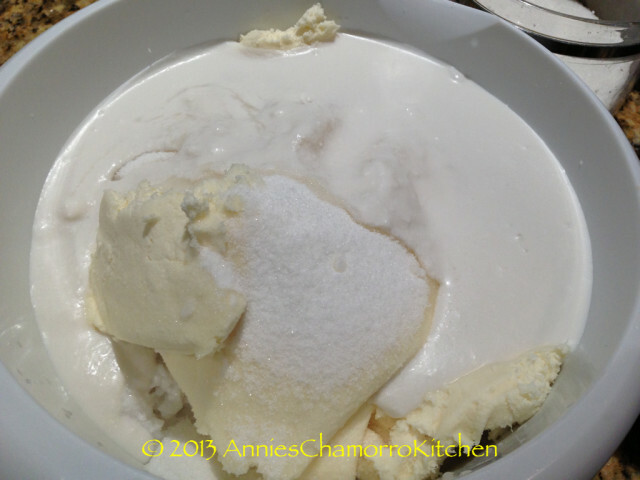 Pour into a small sauce pan then bring to a boil, stirring constantly until the sauce has thickened. 2. Pour the sauce over the steamed tamales. Serve while still warm. Hi. I lived on Guam for awhile then moved to Saipan. I loved eating fried manju. Couldn’t find the recipe. Live here in Virginia. And really miss them. Do you by chance have it? If u do please share. I’d love to share with my kids here. I’m sorry, I don’t have a recipe for fried manju. I am trying to find your location and contact number to order some Apigigi. Leaving island. Please contact me @ 788-7839. Hi Lenora! Sorry, I don’t live on Guam unfortunately. By chance are you the same Lenora (and sister Noralynn) I went to school with? Should I freeze it till I want to steam, or steam then freeze? Either way will work, but I recommend steaming first them freezing. For tameles, can I boil instead of steam? I am born and raised in Guam but live in New Orleans. What can we use if we do not have any Manha here in La. Julie, are there any Asian stores in NOLA? You might find frozen manha there. I learned to make these from my sister-in-law Patty Aguon in Navarre, FL. Unfortunately I forgot the recipe when I went to Georgia for our family gathering. I found your page and you saved my day. Thank you. 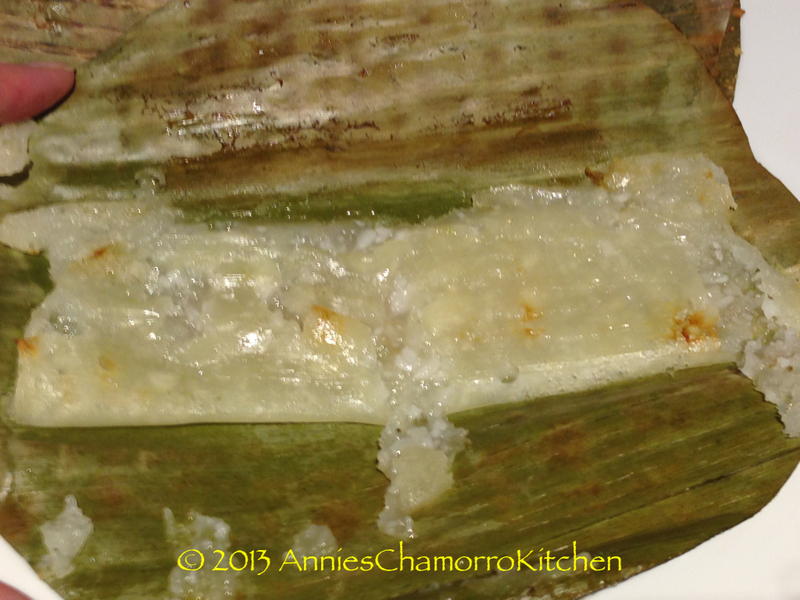 Patty Aguon was not available and I needed to get the tamales done. Hi Bea! I’m glad you found me! Stop by again soon! This recipe is great! Thank you Annie! I also added some ripe mango to a few of them and turned out great too. Thanks, Joe. I’m glad you like it. The mango addition sounds good. Thanks for bringing back some childhood memories by posting the old fashion methods. Living in the Midwest sometimes it very difficult to find some of the ingredients to make our Chamorro food. Thanks again! You’re welcome, Arleen! Stop by again soon! 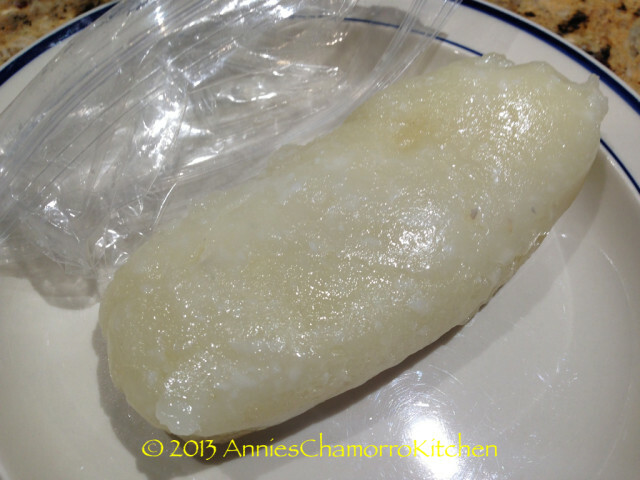 Annie, please reconsider the use of plastic bag in making apigigi. I’ve been reading some warnings on plastics releasing chemicals when heated. One of these warnings was about not leaving bottle water in the car or using the microwave to heat something in plastic container not approved for use in microwave. I think wrapping the apigigi in foil should suffice. Hi Annie what’s your best suggestion for reheating extra apigigi after it’s already been grilled/cooked. 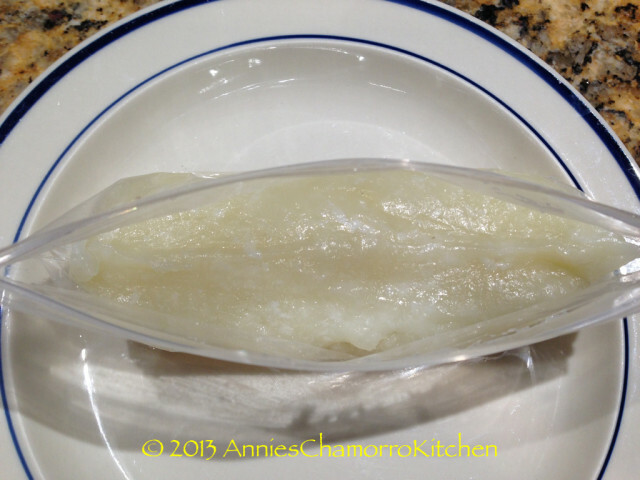 I put the extras in fridge and wanted to know how they should be properly reheated. Hi Christy. I usually heat them on a grill pan or skillet on the stove. Hi Mary. Here are pictures of Månha, and the meat inside. Annie thank u so much for sharing this.. I grew up on Guam for 8 years and have missed the taste of Guam tapioca. Thanks to u I can now have a taste of my childhood in my North Carolina kitchen. They turned out great except I miss the smokey banana flavor. Unfortunately it is rainy and cold outside today so no fire here. Thanks again! Annie…. For the tamales…. 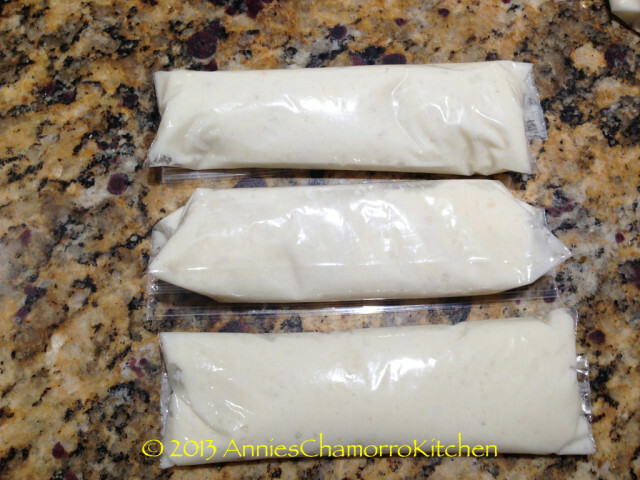 Do you seal the plastic bag before it is wrapped in foil? Also for the apigigi, what can we use if banana leaves are not available? Hi Pam! 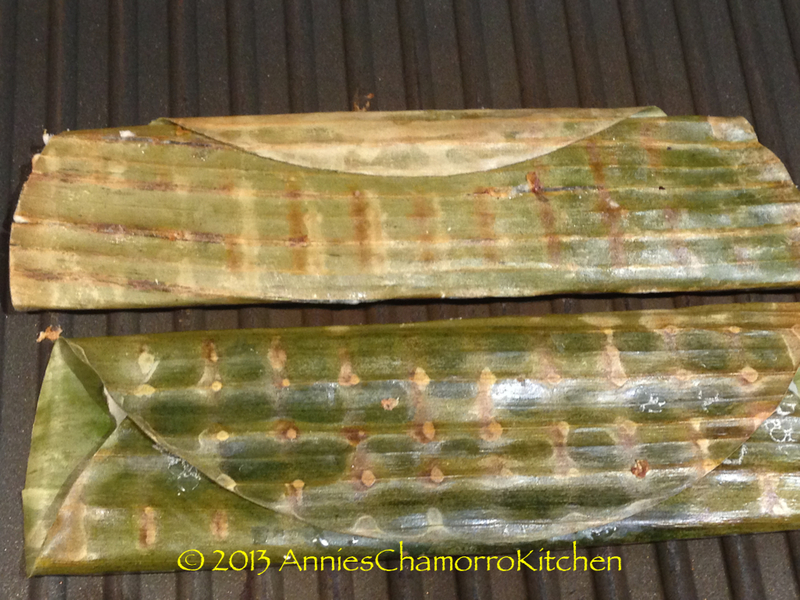 For Apigigi’ you can use aluminum foil instead of banana leaves.